In a world that is being built and maintained by the ever growing arms of science and technology, Guyana’s place is most questionable. It is no secret that besides having sound economic and developmental policies, most, if not all developed countries have made huge investments and advancements in the fields of Science and Technology. Mind you, these were not luxuries which these countries were afforded, they were absolutely NECESSITIES for their development. The need for Science and Technology in our growing economy has not been understated. Actually, I feel it has been overstated to the point of reaching rhetorical proportions! It is very easy for us to acknowledge the need for S&T development in Guyana but it is even easier to sit back and do nothing about it. It is essential that the Government spearhead our ‘leap’ (because that is what’s required for us to catch up with the rest of the world) out of the abyss of natural resource exploitation, and not wait for the Private Sector to take the onus upon itself to lead the country’s S&T development. What is needed is strategic guidance and a national framework to administrate our shift towards developing our human resource in the S&T arena. 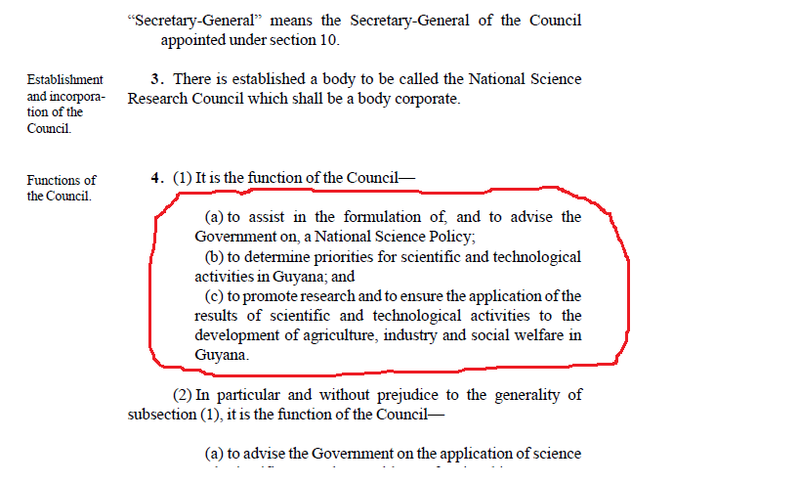 So as it turns out folks, someone, sometime ago, recognized the need for Guyana to have a guided and scientific approach towards S&T development. The NSRC is no longer functioning, but would have been once been chaired by esteemed gentlemen such as Dr. Dennis Irvine and Dr. George Walcott (the GW in GWLT for those who’ve been to UG). As for the much anticipated National Science and Technology Policy, this document, like the National Youth Policy, remains in draft form and it is unclear whether it will ever be moved beyond this stage. There appears to be some utilization of the draft policy however, as both the Minister of Education and the President have outlined areas mentioned in document, and the steps that are being taken with respect to them. Why the reluctance then to present a finalized document to Parliament? Is it because once done, the policy will become legally binding? Or is it because the draft document is severely lacking? If so, why use sections of it at all? The last time I checked neither of the two individuals mentioned has any training in S&T so how can either determine which portions of the document are useful? But let’s just say for a moment that the Policy in itself is irrelevant. The fact remains that the Science and Technology “hawks” remain very vocal and generalized in our society and government, and youth like myself have responded to their calls. The science and technology faculties at the University of Guyana have been taking in more and more students each year. This year alone, in excess of 60 students are expected to graduate with degrees in Biology. Many will attempt to enter Medical School and those who don’t take up jobs in Education will be faced with two choices: go into an unrelated field of work OR migrate in search of existing opportunities elsewhere. My point is, pushing students to study S&T but not providing strategic guidance and opportunities for them is not only foolish, but cowardly. How many of the S&T advocates have had an iota of the gall needed to pursue studies in those fields themselves? Take a head count in our Cabinet as a start. I guess the deceptively lucrative nature of jurisprudence and social sciences overcame their philanthropic urges to move our country forward through S&T, in spite of the supposedly illustrious remunerations. But never mind, let’s tell the kids to do it.They’ll figure something out!